The TUFF Trike range has been designed for the playground environment. Low maintenance with a robust design, the TUFF Trikes are suitable for schools, cycling groups, adventure play centers or home use. The frame is constructed from large profile flat-sided oval tubing to provide extra strength to accommodate larger and heavier riders. The wheels run on sealed maintenance-free bearings and are fitted with broad tread all terrain tires. Bike Length: Size 1: 40", Size 2: 45"
Bike Width: Size 1: 28.75", Size 2: 28.75"
Inseam: Size 1: 22" to 26", Size 2: 26" to 30"
TRIAID is an innovative manufacturer and supplier of children's rehabilitation products. Our design personnel have over 30 years of experience in the design of products for children with special needs. 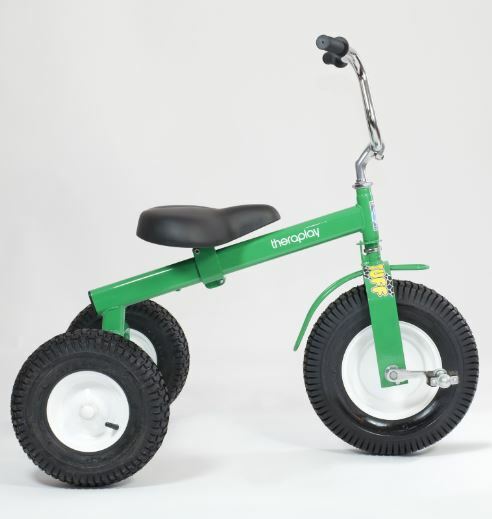 At TRIAID we focus on two main product groups: Foot Pedal Tricycles and Hand Crank Tricycles. All our products have features not found in many similar products and it is this uniqueness that we strive to maintain. 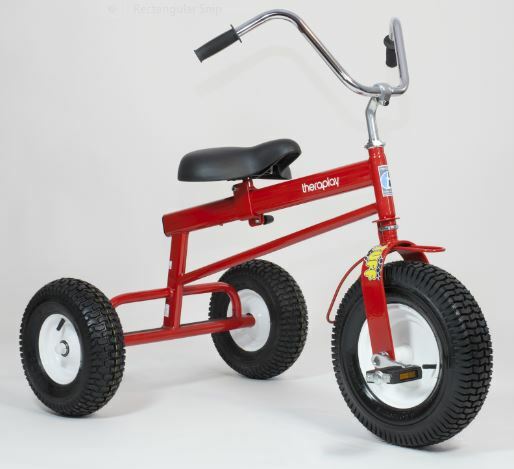 Our foot pedaled tricycles are available in several sizes. The Imp, Terrier, TMX, Tracker 20" and Tracker 24". All models share the same distinctive sporty appearance. The secure feeling provided by an extra wide padded saddle, adjustable high-low bend handlebars, a broad wheelbase and well balanced handling coupled with the extensive range of positional accessories ensures that they can accommodate most physically challenged riders. Our hand cycles are designed for enthusiasts and beginners alike. Sports features combine with comfort and ease of use to ensure riders enjoy a comfortable and exhilarating ride. Every product in the TRIAID range has been extensively tried and tested for performance and suitability.